What Can You, Dad, Do to Bond with Your Baby? As a new dad I felt left out when our first baby entered our family as my wife was breastfeeding and spent most of her time with him. I wanted so much to bond with my baby but I understood that it will be difficult to compete with my wife in this task. After having 4 kids I can tell you that you will not bond as quickly as your wife but we, dads can do it if we take some steps to make quality time with our baby. Taking a bath with a baby can be become a very soothing experience. Put the baby in a sling or carrier and go on with your duties. 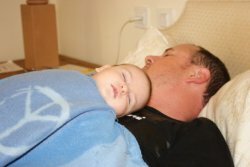 This is an effective way for dad to both get some work done and comfort baby while maintaining close contact. Hold your baby in your arms at about chest level in a cradle position. Getting outside with your baby will calm him/her and help clear your head while you both benefit from the fresh air. Become part of the baby's routine and help out with feedings, diaper changes, bath and other everyday baby chores. Playing games with him/her will help you and the baby to bond.